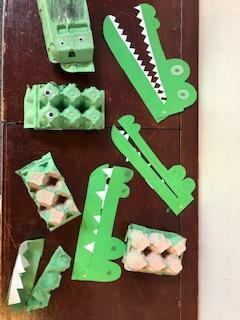 We’ve had a wonderful spring term at Kempshott Under Fives. February started off with lots of Valentine's fun - including our fantastic preschool family disco! Chinese New Year was a chance to try some yummy Chinese food and get creative making Chinese lanterns, dragons and fans. 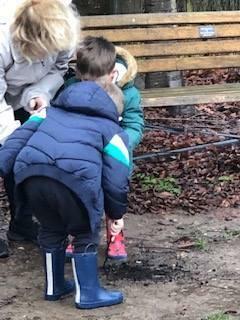 We also released our worms back into the garden - we'd enjoyed caring for them and watching them grow and wriggle in our worm farm - but we found a nice muddy spot in the garden and we are sure the children will see their worms popping up to see them from time to time! Our lovely new play house arrived this term too - it's a great new addition to the garden and the children are really enjoying it. We've been busy continuing our weekly cooking and baking, science experiments (we've had volcanoes, turning old coins into shiny treasures and colour dyes to name a few), and we're getting really good at our makaton signing too! 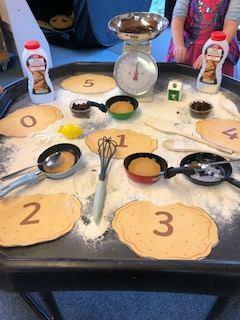 We had great fun with pancake week – making pancakes, flipping pancakes, tasting new toppings, pancake racing and we drew numbers on our pancakes to practise our number recognition too. We celebrated St David’s Day with leeks and daffodils, St Patrick’s Day passed in a haze of green – green painting, green play dough and we baked shamrock biscuits too… We also took part in World Book day and the children came to preschool dressed as some wonderful characters from their favourite books, they all looked amazing, and it’s great to see just how much our children enjoy stories and reading. We also took part in Red Nose Day and came to preschool dressed in pyjamas. We’ve had a great start to 2019, and all the children have settled back into the preschool routine really well. 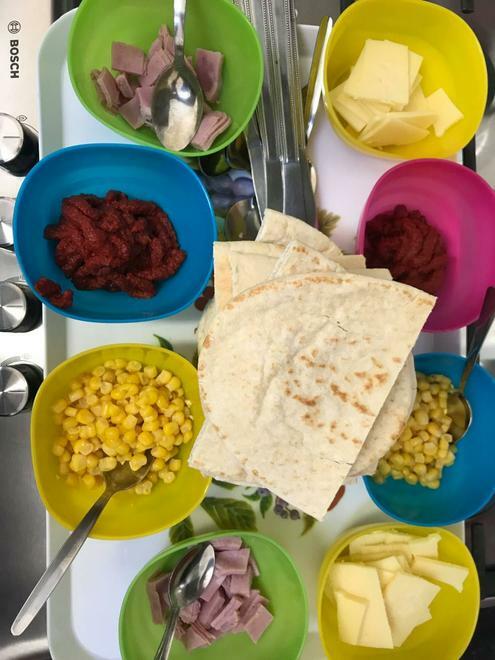 The children are enjoying their weekly science experiments and their weekly cooking and baking - this month the children have enjoyed chopping veg to make warming winter soup. We’re also using Makaton every week during our singing and nursery rhymes. Using Makaton can help children gain a sense of importance and boost their self-confidence alongside their language and communication skills. Children love to use signs and share these with others during activities, especially singing. 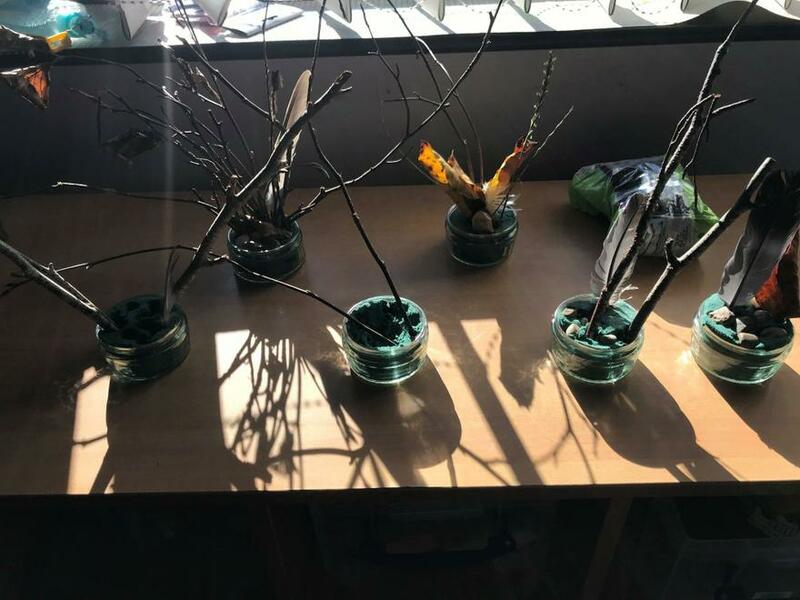 Last month we spent some time looking at winter and the seasons, and this month we continue to enhance our children’s understanding of the world with more weather and seasons activities. We’ve looked at animals that hibernate and have also explored the colder weather. 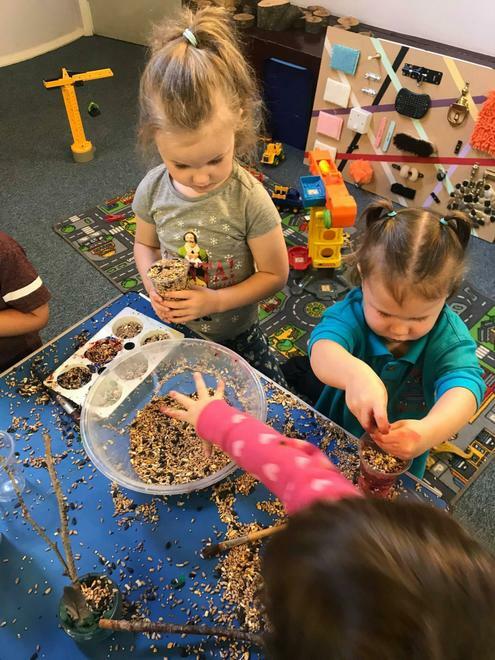 The children always enjoy learning about nature – last term the children noticed there was very little food for the birds in the garden so we made bird feeders – so we’re now watching what birds come in to the garden to feed. 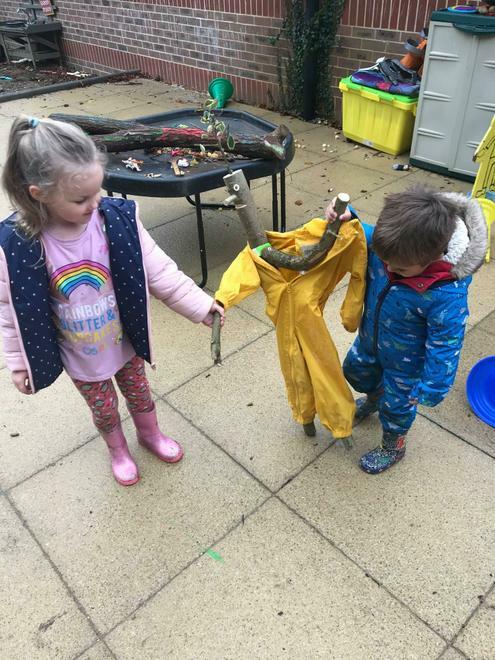 We also continue to encourage the children’s growing independence in the colder months by practicing putting on scarves, hats, gloves and wellies before going out in the garden. An exciting new addition to the room this month has been our tent - the children use their imaginations brilliantly and have been using it in role play, they've made it into a big bears den and into a house. And the tent is now the favourite spot for our story at the end of the day. This month we had an important visit from Maria Miller, MP for Basingstoke. Mrs Miller was visiting to congratulate the managers from Hatch Warren and Kempshott Under Fives on achieving Millie's Mark. 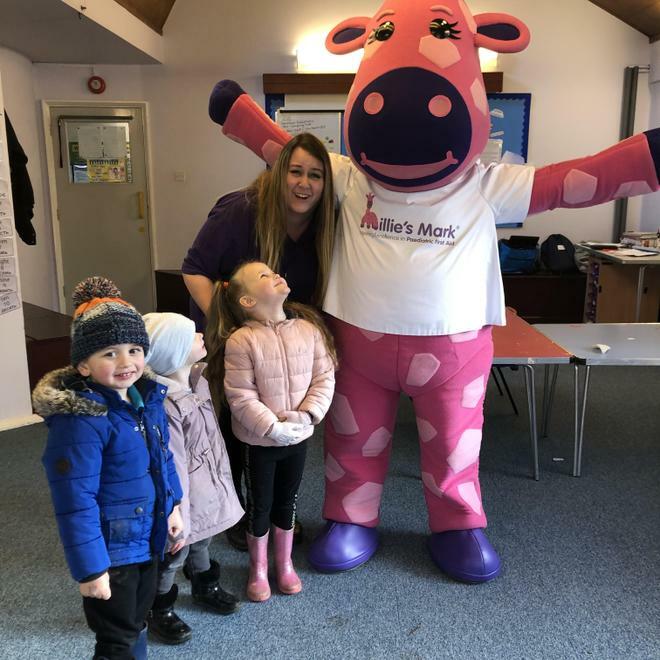 The big pink Millie's Mark mascot also made an appearance, much to the delight of the children. During the visit Mrs Miller took part in a play dough gym session and she thanked our Managers, Melissa and Pam, for all of their hard work and for the wonderful opportunities we are providing for our children. December 2018 - Happy Christmas! We've had a fantastic term and had so much fun with all things Christmas. As you can imagine, we did a LOT of sparkly craft, we practised our number skills with a Christmas tree number hunt and we also did a daily countdown on our advent calendar. A resident Elf arrived for December, who the children named Pixie. Pixie taught us some new songs for our Christmas performance, helped us bake Christmas cakes and watched us make snow globes! Our end of term finale was amazing – the children had so much fun at their Christmas party where they had a surprise visit from Santa. Our parents and families joined us for a Christmas sing-a-long where we sang lots of Christmas favourites plus our own fun take on Baby Shark with our “Christmas Shark” song. 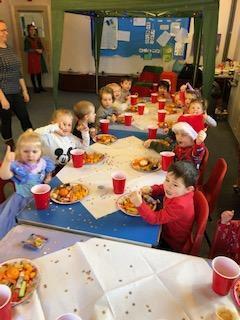 We hope you all enjoy the Christmas break and we're looking forward to our first week back at preschool and hearing the children talk about their holidays, what presents they got for Christmas and which special people they spent time with. We’ll also be back to our story of the week, we have some great books lined up for January, and we will be looking at the season of winter. Staff news - we have welcomed Sara Gibson who has joined us as an Early Years Practitioner. She spent the week before Christmas getting to know our children and has settled in wonderfully! We’ve had some brilliant fun with our “books of the week”. 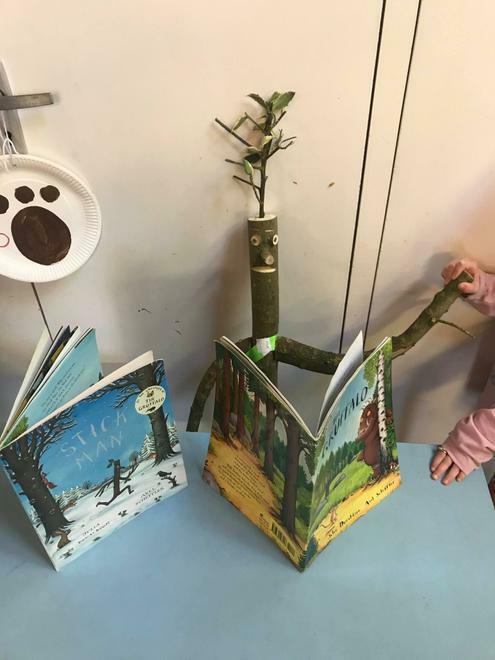 The children have absolutely loved The Gruffalo and Stick Man by Julia Donaldson. 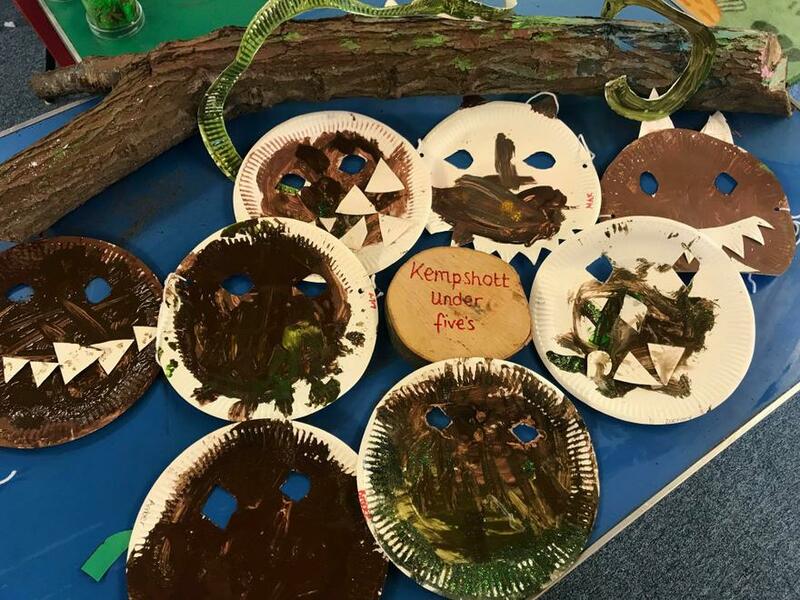 During Gruffalo week we followed Gruffalo footprints on a treasure trail around the garden, we made Gruffalo masks and even made Gruffalo crumble. We also took the children on a walk around the deep dark wood – they didn’t find a Gruffalo or a mouse, but we did discover lots of things for our autumn topic. 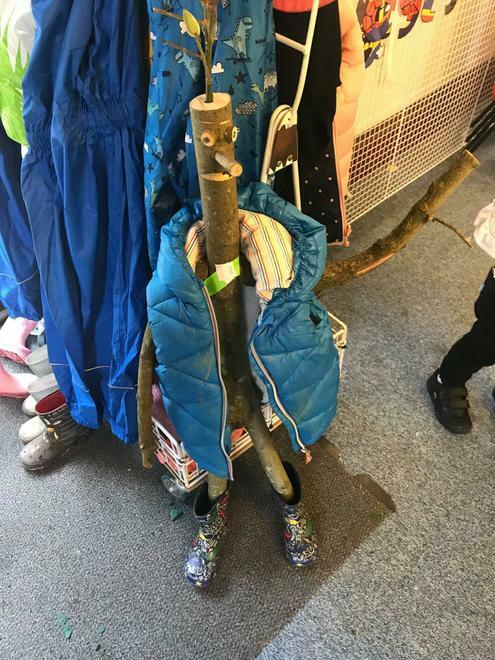 Next the children had a lovely surprise visit from a 'Stick person!' Using our British Value "democracy", all the children voted at circle time for the gender and name. 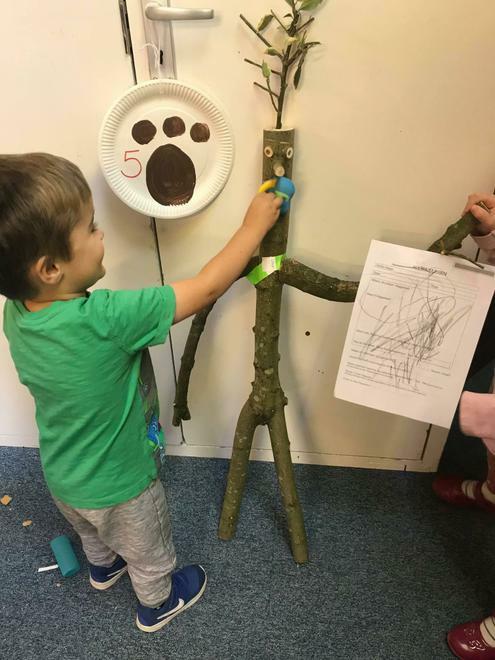 The children come up with 'Steve the Stick-man!' Steve had lots of fun playing out in the garden, wearing his waterproof. Poor Steve then had an accident. So the children gave him a cold compress and a big cuddle and filled in an accident form. Steve then was a little hungry and joined in with snack and made lots of mess....the children were very helpful and helped tidy away Steve's mess. Steve was a little tired after all of today's events and sat down for a story! After a little rest Steve then decided he wanted to have a dance with Angela! All the children then joined in and started dancing. Such a great day! We'll have lots more activities with Steve... lets hope he makes good choices!! During our woodland walks the children collected leaves for leaf painting and looked at the changing colours on the trees. During our walks we also spent time listening to the sounds of leaves crunching underfoot. The children collected wonderful natural resources on our woodland walk to create their own autumn gardens back at preschool. We’ve also made bird feeders this term so are hoping to see lots more birds feeding in our garden. Welcome to a New Year at Kempshott Under Fives! Welcome to a new school year at Kempshott Under Fives! It was lovely to welcome back our older children and our new children have settled in fantastically. The start of a brand new term can be a difficult time for young children and the first few weeks of settling into a new environment is a time of crucial importance to a child's later happiness within a setting. Our first few weeks are always about settling in and helping our children make new friends and get to know staff. Our first topic of a new academic year is always “All About Me”, this is a great chance for the children to learn all about themselves, their new friends and their families. We use stories, arts, crafts and songs to help our children discover what is unique and special about themselves and each other. 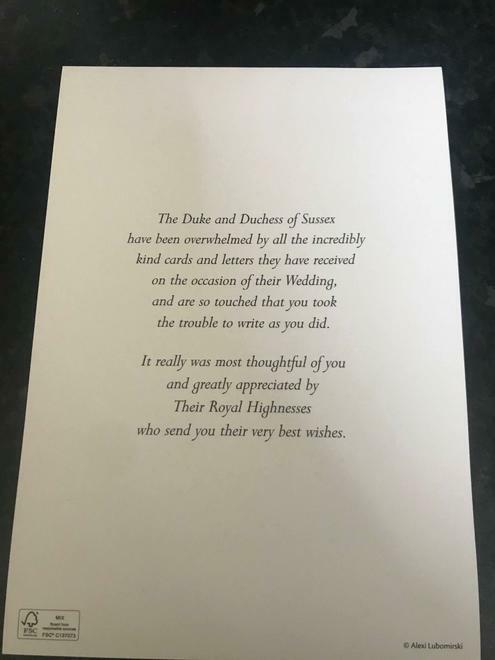 Our postman bought a very special delivery to us on our first week back - a Royal thank you card! 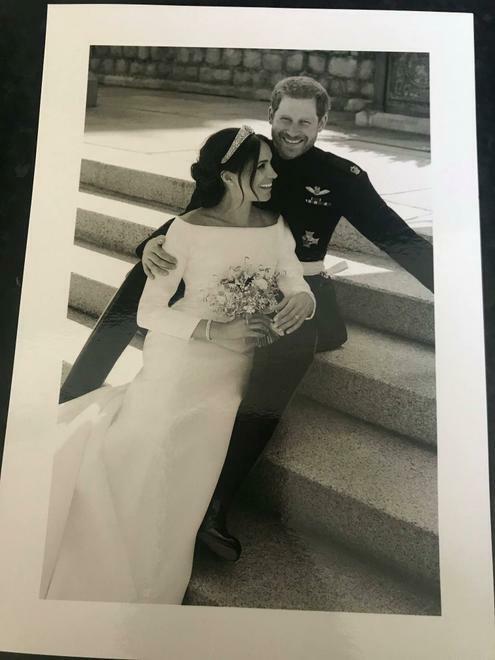 Last year the children made an amazing book for Harry and Meghan's wedding present. Well done to all of our children - it was amazing to have a royal thank you! Our September staff training was all about the outdoor learning environment, so we have some great activities planned for extending our children’s learning outdoors all year round. As the weather is still warm, the children have been enjoying lots of outdoor play on our new patio, which was built over the summer holiday. This will provide a much bigger and cleaner outdoor play space for us during the muddy winter months! Speaking of new things Charlotte made our children a wonderful sensory board over the summer. 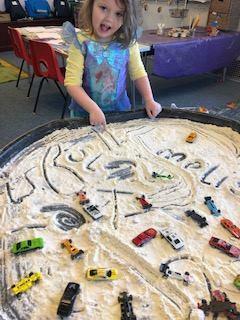 This is a wonderful addition to our resources at Kempshott Under Fives - the children love exploring the board and these type of sensory experiences are vital for young children's brain development. 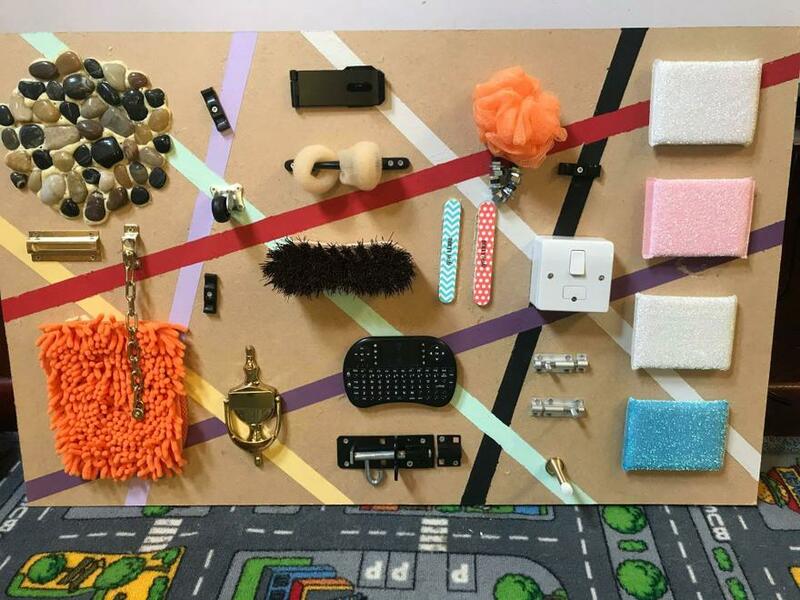 A sensory board can also help fine motor skills as children coordinate their movements to feel the different materials. It also helps children to gain a sense of themselves as they begin to develop preferences to which textures they like and dislike and it can help children learn new words as you use words to describe the different things they are feeling. At Kempshott Under Fives we love natural resources, we've collected lots of interesting natural materials over the summer. 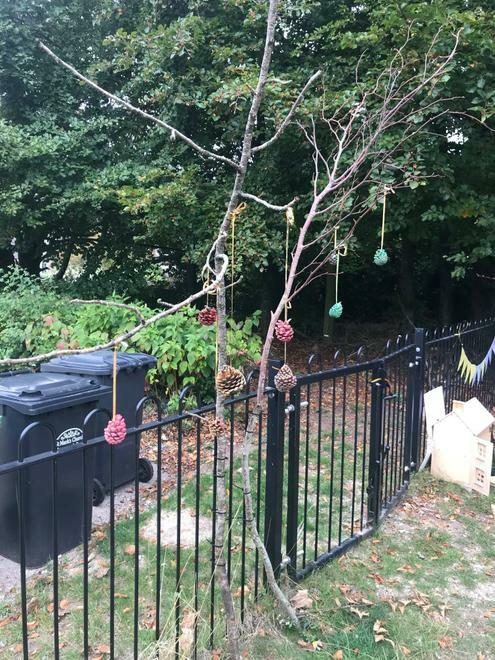 The children have been very curious and very creative with our resources and have created their own balancing beams and painted pine cones to hang on our "stick people" as garden decorations. 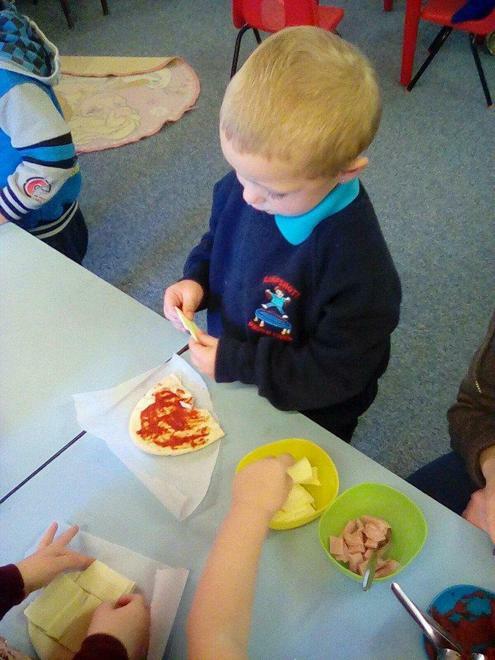 The favourite cooking activity this month was pizzas - who doesn't love a pizza? We've also enjoyed Farmer Duck and Five Little Ducks as our Books of the Week. We love Spring term. It's a great time of year to see wildlife and flowers, throughout spring we’ll be exploring the season and looking at trees starting to shoot new leaves, flowers starting to grow and the baby animals that are born in springtime. We've also had fun doing lots of different nursery rhyme activities. 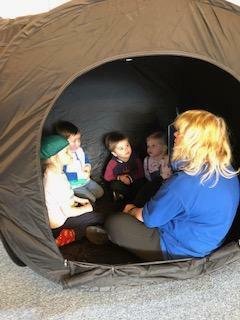 We followed National Storytelling Week and read lots of stories with the children, encouraging them to make up their own endings and asking lots of questions aimed at developing their thinking and understanding (Listening to stories with increasing attention and recall is an expectation of a typical child aged 30 to 50 months). We loved reading the Gruffalo, Going on a Bear Hunt and Goldilocks. To continue our books and storytelling theme, we will also be joining in with this years World Book Day on March 1st. 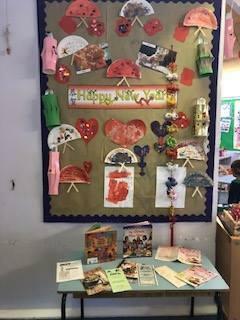 Our other February highlights were of course Chinese New Year, Pancake day and Valentines Day, so much yummy food to taste and a busy craft table full of hearts and sparkles! 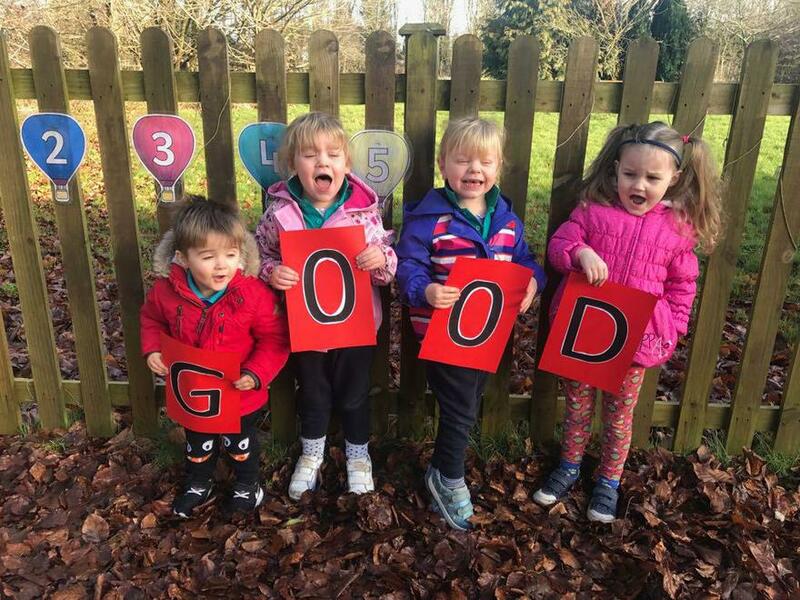 We are delighted to announce the result of the first ever Ofsted inspection at our Kempshott Under Fives setting, which was carried out on 15th January. Our overall grading is GOOD. Melissa Keane, our new Manager, has been instrumental in creating a wonderfully warm and caring environment for all the children within our care. We delight in providing new experiences for all children to engage and motivate their learning, whilst aiming to form close bonds with families and carers. We are very proud of our amazing children and of our wonderful Kempshott Under Fives team. Happy New Year from Kempshott Under Fives! As usual, our first week back will be a wonderful week of listening to the children talk about their holidays, their Christmas presents and the special people they spent time with. We are sure to see the children recreating some of their Christmas memories through their play. We’ll have pretend Christmas cake making in the role play area, pretend dinner with family, and paper and sellotape to wrap presents, just like Mummy does! This links perfectly to the Department for Education's "Early Year's Outcomes" which says that a typical child aged 30-50 months should be able to "remember and talk about significant events in their own experiences" and "recognise and describe special times or events for family or friends". We’ll also be exploring nursery rhymes this month. We’ll be having fun with traditional nursery rhymes and creating some fun activities – cotton wool painting with black paint for Baa Baa Black Sheep, making spider webs for Incy Wincy Spider and hunting for the lost toy sheep when Little Bo Peep appears. We’ll hopefully be learning some new rhymes too. When we look at our season of winter, we’ll introduce the theme of nature and birds. As there’s not much food for the birds at this time of year, we’ll be making bird feeders with the children so they can watch the birds come and feed in the garden. We have some exciting staff news for the New Year – Melissa Keane, our current Deputy, has been promoted to Preschool Leader at Kempshott Under Fives and Angela Blomquist, who is the SENCO for both Kempshott and Hatch Warren Under Fives, will be stepping into the Deputy position to work alongside Melissa. Congratulations to you both! December is always a magical month at Kempshott Under Fives, there is always so much planned and so much to prepare! Sadly we said goodbye to Yvonne, our Preschool Leader, at the end of November. Yvonne has been offered the opportunity to combine her childcare experience with her volunteering work and her faith in a role as an outreach worker for the Methodist church. 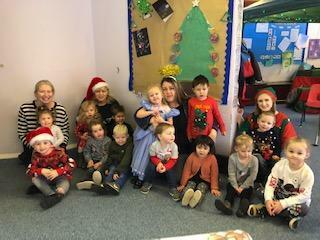 In her leaving speech Yvonne said, “It is with sadness that I will be leaving the preschool, it has been an honour to have met and watched your children grow and develop into the wonderful little people they are. I have had the privilege to work with the most amazing individuals who understand the importance of the early years and have been blessed with wonderfully supportive parents.” We wish her lots of luck. December is a wonderful time of year for circle time – we’ll be talking about what Christmas is, about special people and family and giving presents to others. We’ll also be talking more about sending cards, cooking festive foods and about helping others at this special time of year. Of course, we’ll also be hearing about Father Christmas and what’s top of the Christmas lists this year too! This is also our favourite time of year for crafts – we have a month of glitter, bright colours and sparkle on the craft tables with cards, decorations and Christmas creations to make. The tree is up and has been fantastically decorated by all of our clever little hands. Our Christmas performance is our highlight of the term and it’s been a busy time preparing. Lots of little superstars will take to the stage to perform our Christmas play for parents. The Christmas play always ties in well this term’s Communication and Language learning target - for children to maintain attention, sit quietly and introduce storylines into plays – this is a perfect opportunity to demonstrate how well our amazing children are doing. Wishing you all a Merry Christmas and a Happy New Year. See you back at preschool on 4th January 2018. 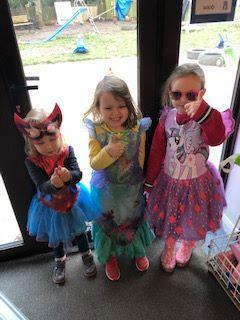 We’ve had a great first half term at Kempshott Under Fives – our little ones have adjusted well to new staff, new friends and new routines and have thoroughly enjoyed our first topics. We’ve spent the past few weeks learning about autumn – we’ve looked at animal that hibernate, collected leaves for leaf painting and looked at the changing colours on the trees. It’s a great season for getting outside so we’ve also spent time walking and listening to the sounds of leaves crunching underfoot. While we’ve been outside the children have noticed lots of cobwebs, so we’ve also made spiders and cobwebs on our craft tables. We’ve been baking too - for our Harvest Festival celebrations the children helped bake bread and attended a small service in church. This term we’re looking at light and dark. We have bonfire night coming up, so at preschool we’ll be creating lots of colourful crafts, and exploring the sounds of fireworks. The children will also get creative with crafts for Diwali, the Hindu festival of lights. Our first event took place before half term with our annual Teddy Bears Picnic. Children from Kempshott Under Fives went down to the woods with family and friends (and of course their favourite teddy bears), and enjoyed a teddy bear trail, face painting, games and there was even a prize for the best-dressed teddy! A big thank you to Sainsburys, Hatch Warren, who kindly donated picnic food for the event – generosity from local businesses is always hugely appreciated by our charity run preschool. It's lovely to be back for a new year at Kempshott Under Fives, to meet our new children and to see how much our older children have grown over the holidays! We've spent our first few weeks on the topic of All About Me - a great chance for the children to learn all about themselves, their new friends and their families. We use stories, arts and crafts and songs to help our children discover what is unique and special about themselves and each other. The children have learnt lots of names, created some self-portraits and compared the colour of our hair and eyes. The children have also been cutting out pictures of things they like – animals, flowers and of course lots of toys. The theme for the term is Autumn. There's so much fun to be had learning about Autumn - just some of the things we'll be exploring are animals and hibernating, there'll be lots of leaves and colours, leaf painting, listening to the sounds of leaves crunching underfoot on our Autumn walks, we'll be making spiders and cobwebs on our craft tables and looking at the changes outside throughout the season. 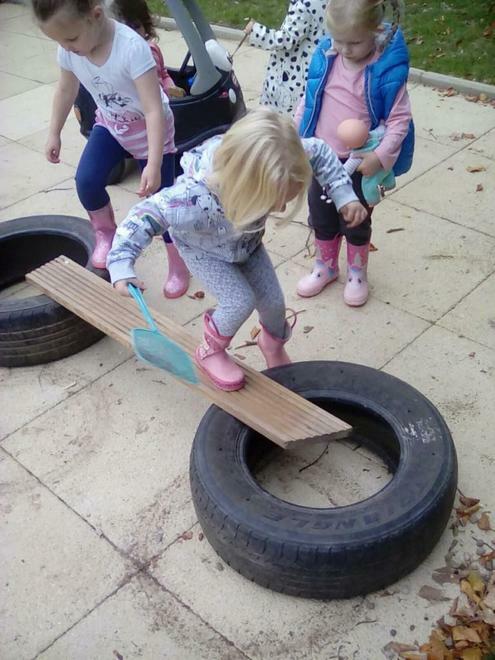 June is always the perfect time of year to enjoy lots of great outdoor activities at preschool and it’s also when we get busy preparing our older children for school! We recently took part in the National Children’s Day activities, which aims to promote the importance of a healthy childhood. We created our own mini Olympics for the children and held a sponsored obstacle course, which was great fun. We will soon be joining our sister preschool, Hatch Warren Under Fives, for a preschool trip to FInkley Down Farm. This will be a great opportunity to see all of the baby animals that we learnt about last term. This month we will be talking about which schools our children are going to and will also begin to introduce lots of activities in preparation for big school. This term is when our “school readiness’ begins, so we will begin to introduce lots of activities to prepare our bigger children for school. Can the children change into their PE kit by themselves? Can they independently wash their hands and open the food in their lunchbox? We’ll also be having some exciting learning adventures all around the theme of mini beasts. Mini beasts is a perfect project for spring and summer and we’ll be spending plenty of time out in the garden hunting bugs. We’ve also had a new arrival to preschool - baby caterpillars - which we’ll be watching grow and transform into butterflies to eventually release in our garden. While we’re learning about life cycles of a butterfly we’ll be taking a look at The Hungry Caterpillar – this is always a great opportunity for lots of fun crafts and counting. Our Hungry Caterpillar topic also introduces us to healthy eating and learning more about different fruits and where they come from. This term we welcome a new Deputy to Kempshott Under Fives, Melissa Keane. And congratulations to Tanya Welton who is now a permanent member of our team! The term has flown by again at Kempshott Under Fives. We’ve had amazing fun planting, growing, crafting and celebrating…and we have one last blast to come with our preschool Easter egg hunt, always a great afternoon and brilliant to finish the term on a big chocolate high! The craft tables have been busy over the last couple of weeks with Easter cards and bonnet making - we’ve seen some fabulous Easter bonnet creations so far. We’ve also been remembering the real story of Easter during circle time this month. 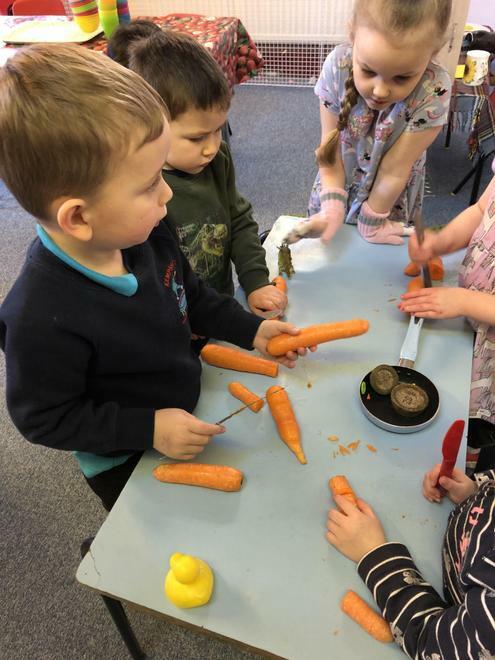 When the children return to preschool after the Easter break they will be keen to get out in the garden and see what’s grown. They’ve spent weeks planting a vegetable patch and tending carefully to their seeds, so we’re hoping the children will soon begin to see the fruits of their labour. After the holidays we’ll also have some new pets to introduce. We’ll be watching caterpillars’ transition into butterflies, which we’ll release into our preschool garden. March officially marks the beginning of Spring, so for the second half of our Spring term we’ll be doing a spot of gardening at Kempshott Under Fives. We’ll be creating a garden centre at preschool where the children can plant and tend and help with their very own vegetable patch. We’ve also got some fun experiments planned to teach the children more about plants. When we’re not in the garden we’ll be learning all about doctors and hospitals with lots of fun role-play listening to heartbeats and bandaging our patients. Also coming up in March we’ve got our annual Mother’s Day Afternoon Tea – a treat for all of our Mummy’s who will be served tea and cake by their little ones. This month you won’t be able to miss the reds, pinks and hearts in preschool. But our big activity for Valentines will be baking with love, because there’s no better gift on Valentines Day than a homemade treat from your little loved ones! We have a fundraising event for Valentine’s Day too. 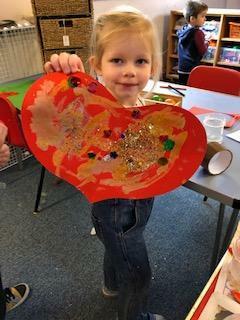 As a charity-run preschool we organise a number of fun events throughout the year and on February 11th we’re holding our first ever preschool Valentine’s Disco – a fun date for all the family featuring face painting, glitter tattoos, glow sticks and of course lots and lots of disco dancing! 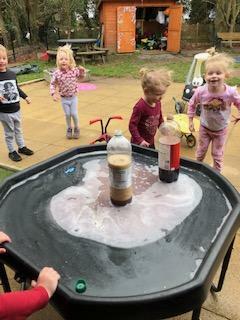 A New Year at Kempshott Under Fives and we continue to enhance our children’s understanding of the world with our weather and seasons activities. Our first dusting of snow this year caused huge excitement among the children and inspired by the snow outside they created a very adventurous art project of a giant snowman for the wall - it looks amazing. We also had fun making our own snowstorms to prolong the magic of the white stuff. The theme of nature has also been introduced this term. As there’s little food for the birds at this time of year we’ve been outside making bird feeders – and we’ve all thoroughly enjoyed watching to see what birds come in to the garden to feed. 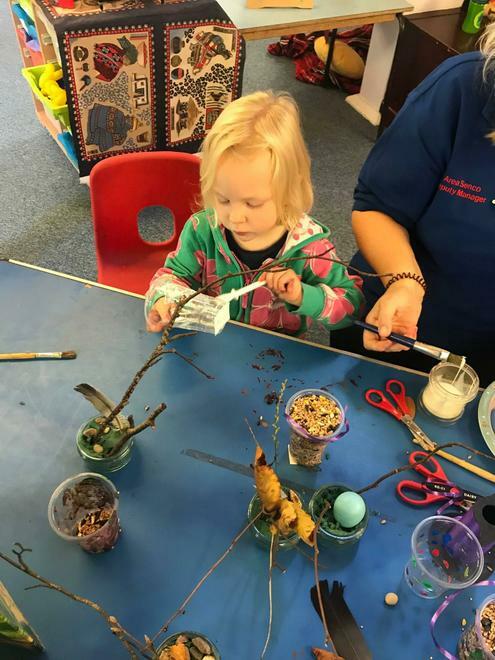 …Except at Kempshott Under Fives – it’s a truly fun and magical time at our preschool and it’s definitely beginning to look a lot like Christmas everywhere you go! The children kicked off the Advent season with fun rhymes and favourite Christmas stories at circle time. We’ve also discussed what Christmas is – of course it’s when Father Christmas visits, but we’ve also talked about giving presents to others, sending cards, cooking special foods and that Christmas is a time of year where we think more about helping others. December is set to continue in a glittery and sparkly blur making cards and decorations, hanging them, singing Christmas songs and putting up our preschool Christmas tree. And of course, as Kempshott Under Fives is located in St Mark’s Church, the children will be lucky enough to perform their nativity play inside a church. One of our learning targets this term for Communication and Language is for children to maintain attention, sit quietly and introduce storylines into plays – our Christmas Nativity will be a perfect example of how well our amazing children are doing! As exciting as it is, Christmas hasn’t been the only topic we’ve covered this term – we’ve had many other celebrations to discover during autumn including Thanksgiving and Bonfire Night. We had some pre-Christmas sparkle with our fireworks theme. The children created amazing firework pictures and we focused on the noises, words and sounds of fireworks to support the literacy area of our learning. Poppies then filled our room for Remembrance Day and the children did a fantastic job of upholding two minutes silence on 11/11. They say time flies when you’re having fun, and we’re amazed at how quickly the first half term of 2016 has gone at Kempshott Under Fives. Our main focus this term has been on families, our community and ourselves. The children have drawn around each other to learn all about different sizes and to measure the tallest and shortest in the group. They've also had great fun creating their own shops as part of the community theme. And we've been digging a huge hole "Down Under" in our mud garden, back to Australia where one of our children used to live. 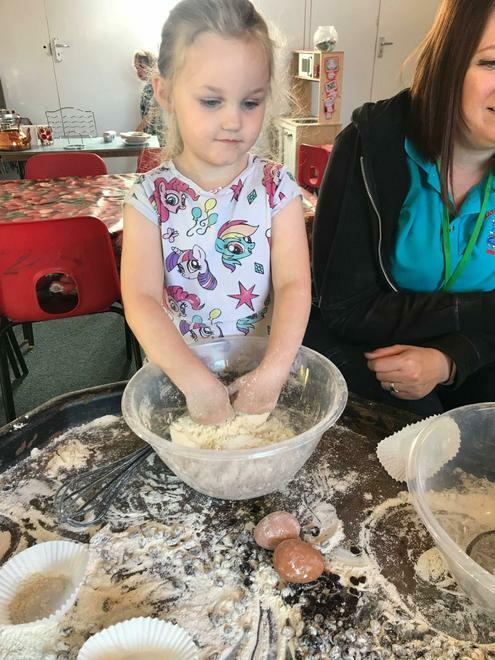 Making mud pies in the garden is one of our most loved pastimes, so we've extended this activity inside the preschool and have been doing some real baking with the children so they can actually eat their creations! Our new resident Toby was introduced to the children a few weeks ago. Toby is our preschool mascot, and he arrived with his own bag packed full of colouring sheets and a diary so he can go back with the children for sleepovers and new adventures. We also spent a week in the great outdoors before half term. 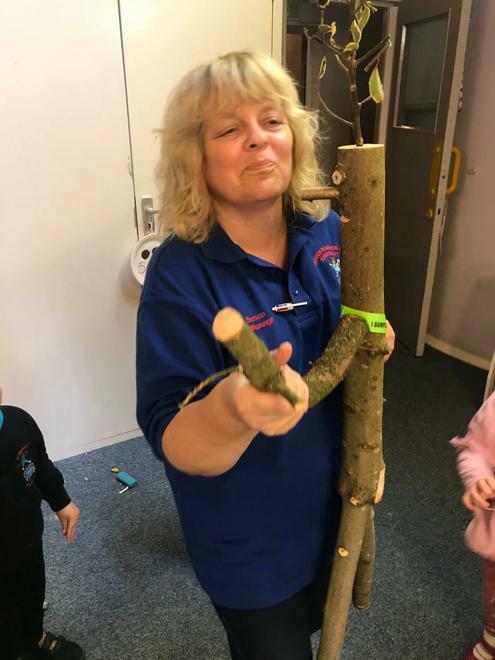 Woodland week is a firm favourite on our activities calendar and the children had a great time discovering bugs, making dens and collecting some lovely autumn leaves and pine cones. And while we were down in the woods this year, together with our sister preschool Hatch Warren Under Fives, we hosted our own Teddy Bears Picnic for siblings, friends and families. The children and their favourite teddy bears enjoyed a teddy bear trail, face painting, games and party food and there was even a prize for the best-dressed teddy!